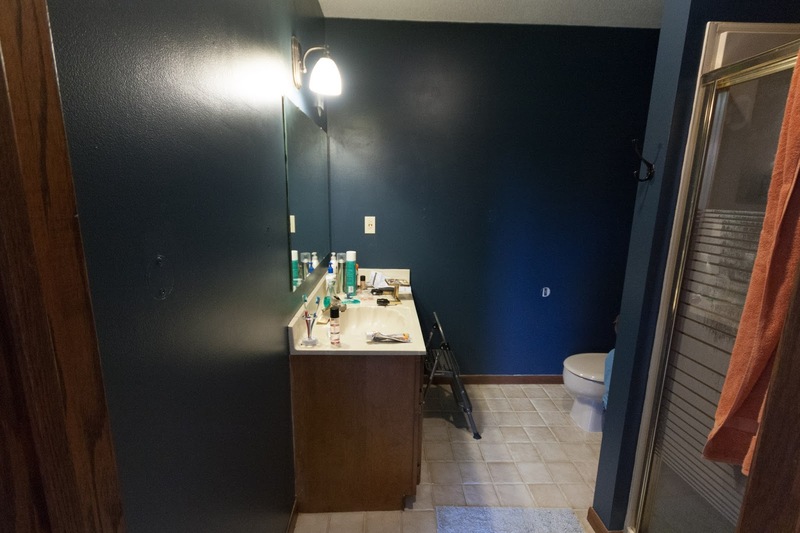 About a week ago, I started the process of painting the bathroom. I started with the ceiling, like a good little homeowner. 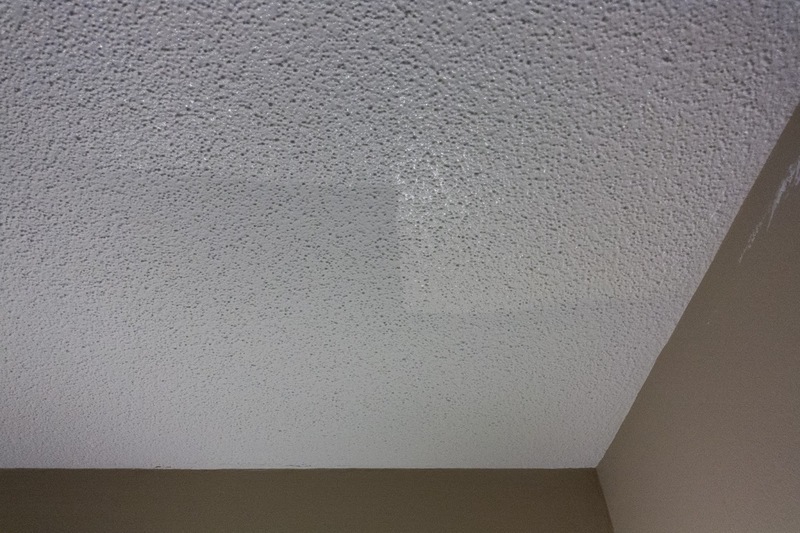 Even when you think the ceiling is in good shape, you realize it's not when fresh paint goes on. In our case, the color I put on the ceiling was a little more cream than what was recently painted, but cream works better in here. Let's just not talk about the awful popcorn I will not be removing any time soon! 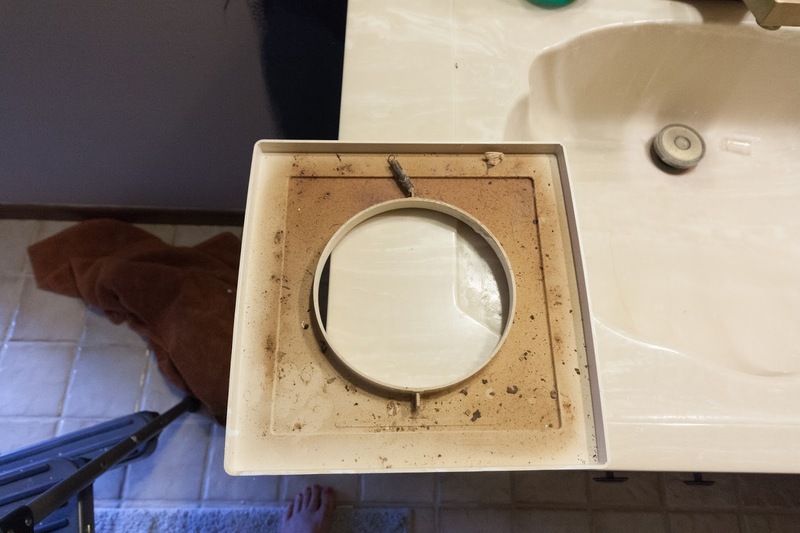 I'm pretty sure this fan and cover have NEVER been cleaned,even though the house was just repainted for the sale. A little wash and spray paint took care of the almond cover, and yours truly picked all the gunk out of the fan with my fingers and a paper towel. As it rained down on my head and face. Gross. It looks good now, though. Please ignore the shadows on the ceiling from the light. It was dark, which I was expecting...but knowing it beforehand and actually seeing it are two different things. I also used eggshell because I thought a little sheen would be nice to reflect light in a dark room. I always use flat, always. And even though I knew darker paints look even shinier, I was still shocked by the gloss. The worst part is seeing all the roller and brush strokes. But after two coats, I was pleased. And I set about installing the new sconces I got for the room. I rarely ever turn off the power to a room when I'm changing a light, usually I turn off the switch and call it good, and YES I sometimes get shocked. 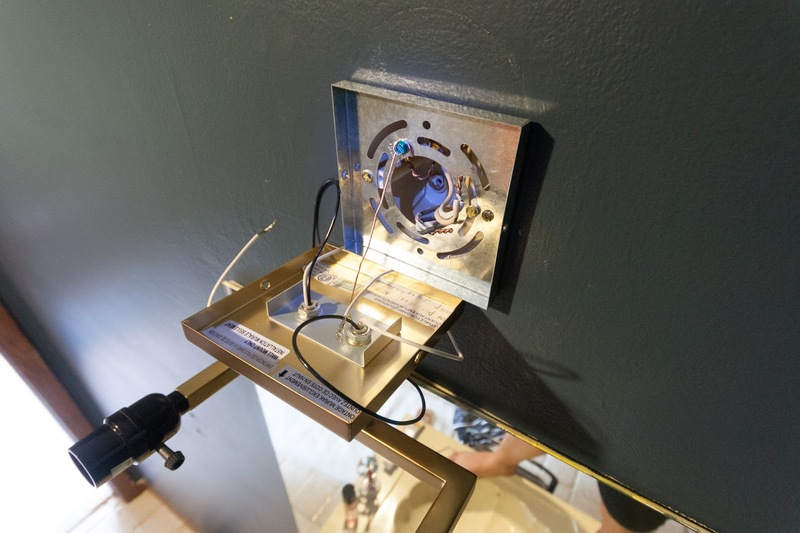 In fact, I did while installing the left sconce because I forgot I had the switch on while messing around with it. I'm an electrical superhero. Or super idiot, depending on how you look at it. I have to say, having a newer home is like heaven when you are replacing light fixtures. New wiring! No cloth! 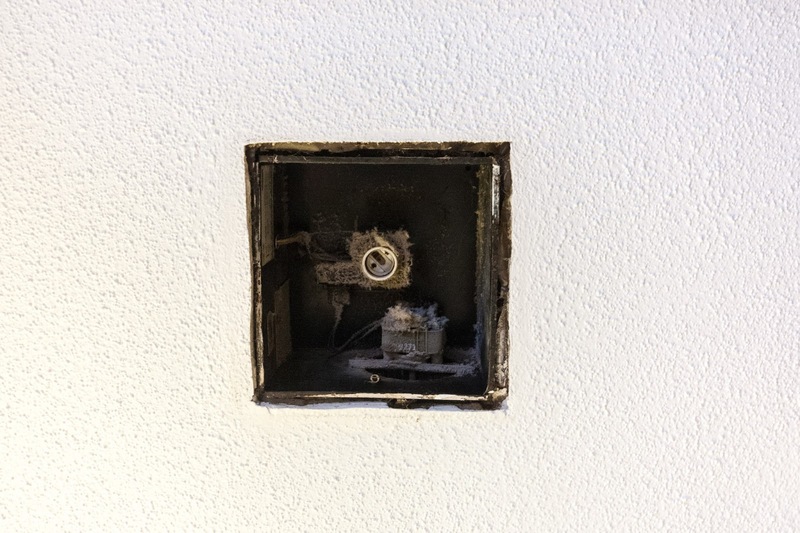 Standard size junction box! 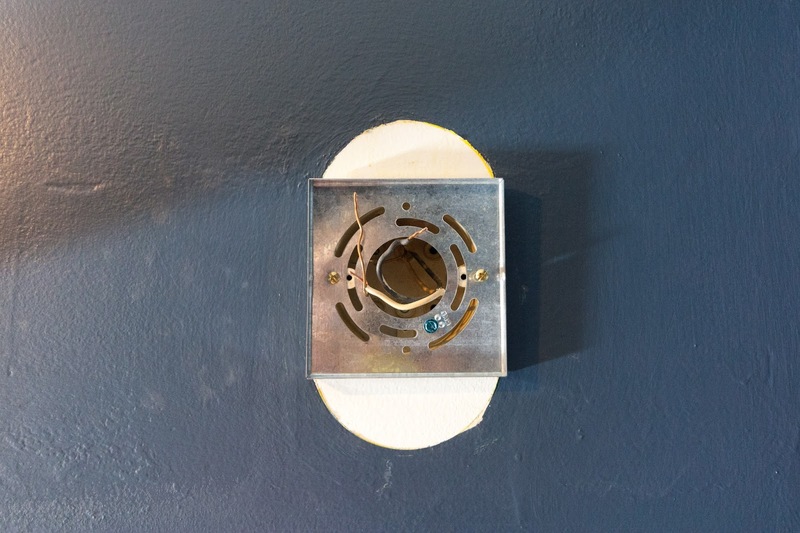 The only thing I wish is that I hadn't painted around the old sconces, that created a bunch of sanding and scraping to remove the paint ovals from around the new square fixture base. Dumb. 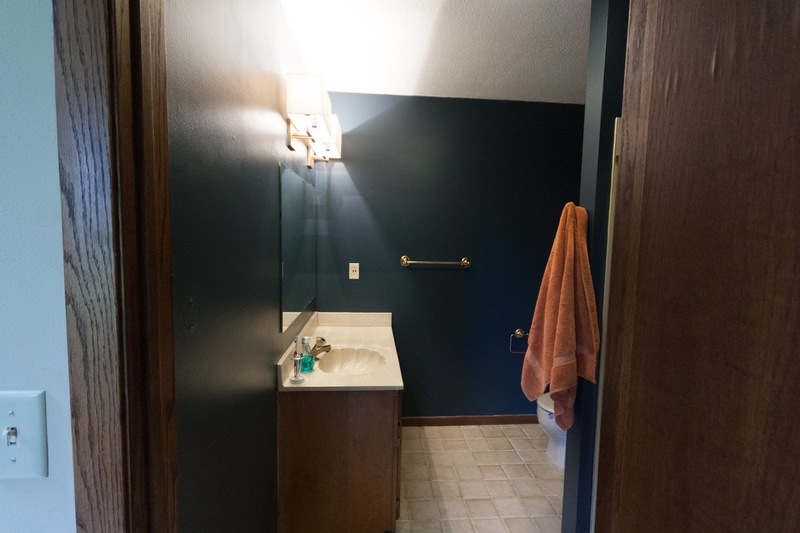 I know this bathroom was added to the house sometime in the 80s, so I was interested to see this light was from 2008. 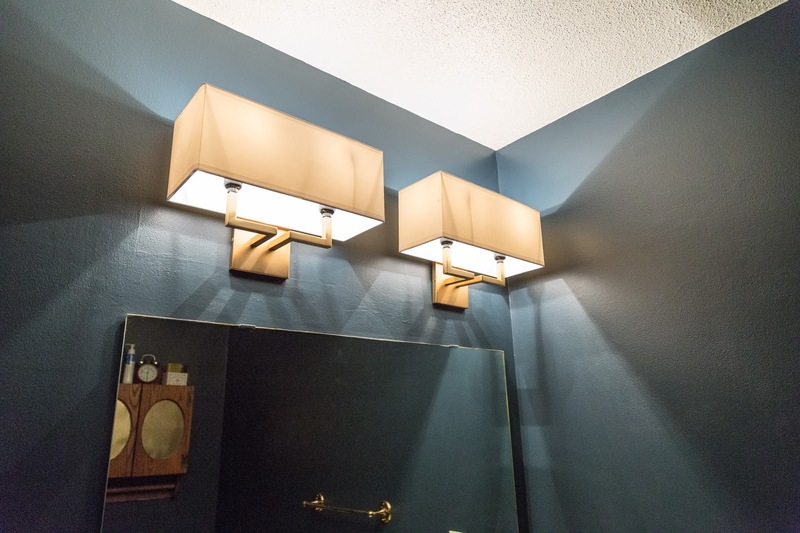 I wonder if whoever put up these boring sconces took out some awesome polished brass beauties and threw them out. Would not surprise me. 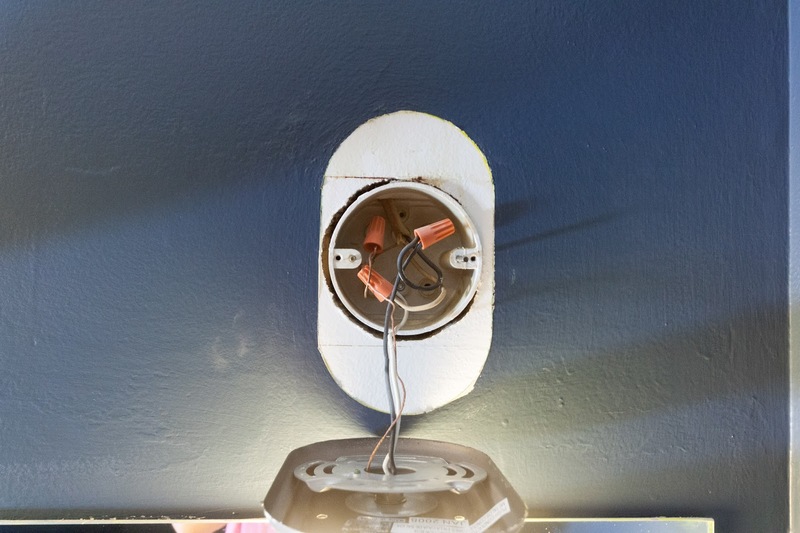 When I'm putting up new lights alone (ahem, which is every time) I have a little trick if you are installing a light light. I mean, a light that isn't heavy. I usually wrap the ground wire around the screw to hold it up while I do all the connecting of the wires. Works great on wall sconces! Less great on ceiling fixtures. I usually sweat much more profusely while installing ceiling lights. FYI - my electrical advice is probably not good. Don't listen to me. 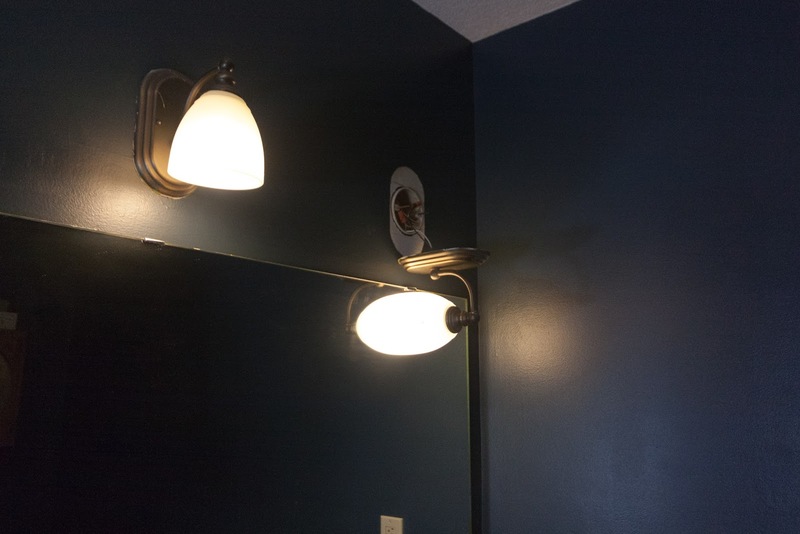 You guys, I was so happy when I got these both up...then I stepped back and noticed the right sconce was a full half inch lower than the left one! 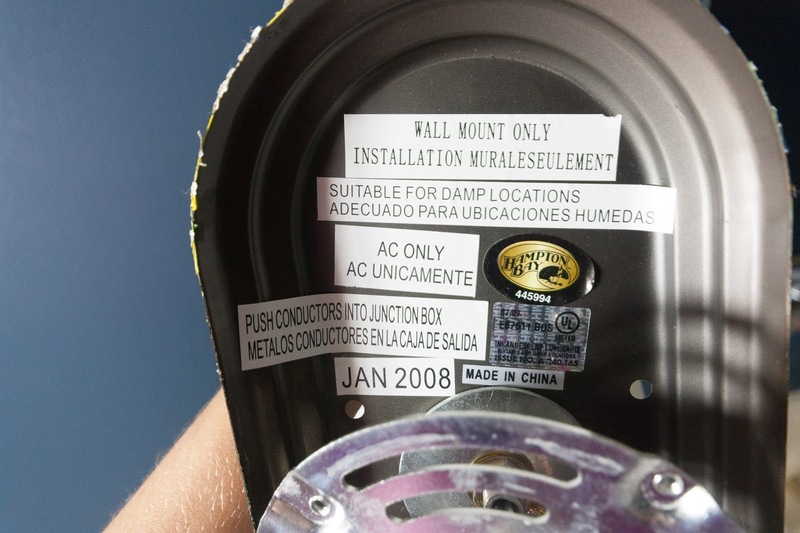 The junction boxes were not level with each other. I was so pissed and spent the next 20 minutes mucking around with the adjustable portions of the mounting strap trying to cheat the fixture up on that side. 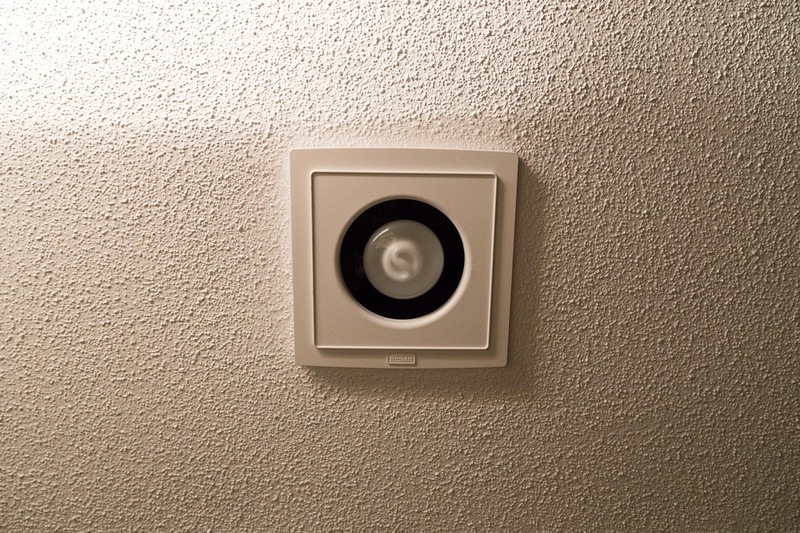 The right side box is also not flush with the wall but I can't seem to get it flush no matter what I do - so the fixture sticks out at the top. Ugh, new electrical was supposed to be easy! But, they are up and level. And we both LOVE them! 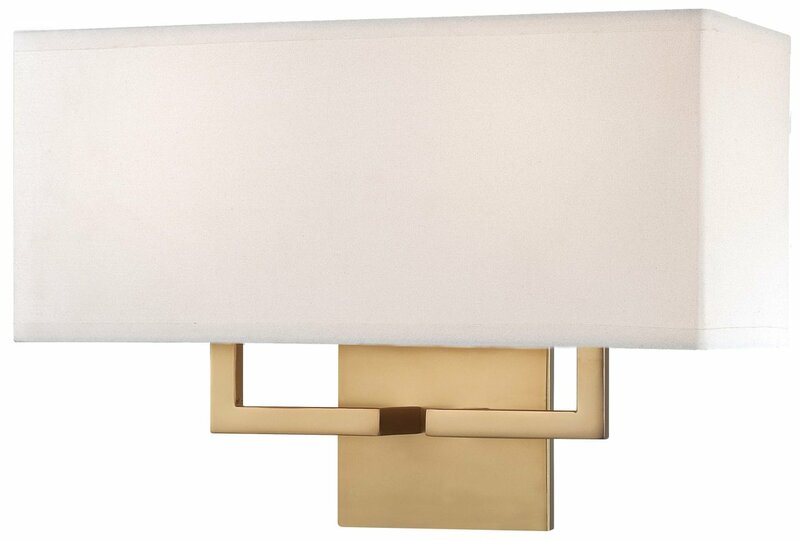 Here is the fixture I got, a George Kovacs 2 Light wall sconce from Lighting Direct in Honey Gold. I knew it would class up the joint, and I liked that I could put two 60 watt bulbs in each light. I also like that the light will be thrown mostly UP, which is more flattering than down lights. It reflects off the white ceiling and just feels so much nicer. Love, love, love! This is a photo at night, the wall color looks more teal and the lights are so gorgeous. So, you can see the eyesore in the photo above, the 80s country cabinet that I haven't decided what to do with yet. I know it has to go, no amount of paint or hardware could bring it into the present day...but we do love the extra storage. Open shelves would modernize the space, but I don't know if I want to throw all my toiletries and things in baskets. I'm extremely lazy about putting away toiletries, as you can see from my little table. What do you think so far? LOVE the lights. I vote open shelves even though I too am bad with baskets. Hi Sara ... one room down! The lights are beautiful and I love that the paint shows sort of teal ... that was my vote. the lights are great and i like the dark color. i did surprisingly ok with open baskets at our last house, i tried to group things together so i could just grab my makeup basket, or my hair basket, and then put it away when done. The lights, paint and clean fan really make a world of difference. Love the lights and how they really make the room nice. Good job. As for the cabinet, GET RID OF IT. It is 80's and it has to go. I would take it down and look for glass shelving or wood shelving. How about just hanging a picture?!. Get a small floor cabinet for your toiletries or put under the sink. But.....the shelf is gone...out of there! Keep up the good work. It is going to look gorgeous!!! It looks great. The lights really do help it look more up to date. Now, you just need some cool art on the walls and maybe a different mirror. 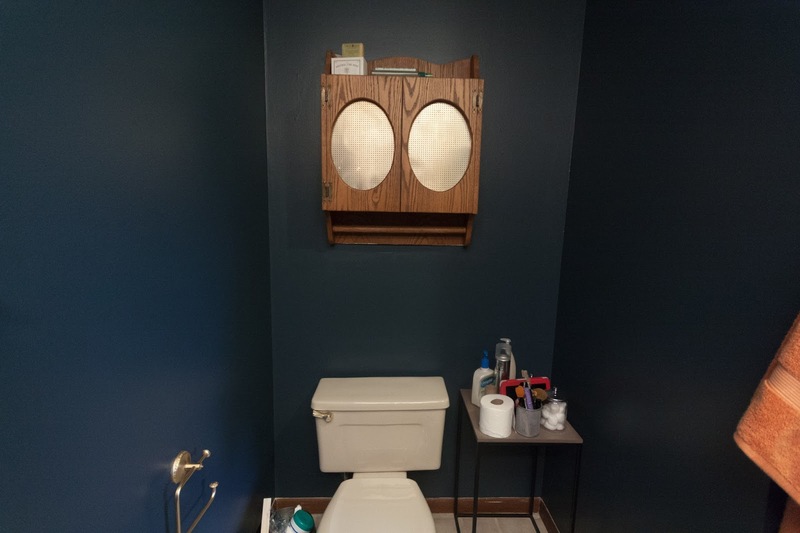 I agree that you need to get rid of the cabinet above the toilet. You can do better!!! You don't have to have open shelves. I'm sure there are other cabinet options out there. Be patient and find just the right thing! Hmm, could you paint that little 80's cabinet and somehow use some awesome fabric on the inside pieces in the ovals? Either way, the bathroom really looks nice! The biggest problem with the cabinet is the 'H' hinges on the outside of the doors...they are that old hammered pointy style that is so ugly and replacing them with nice squared off polished brass ones would be expensive. Those hinges are a specialty item I guess. I'm definitely going to trim out the mirror with something, thanks for all the comments everyone! Swap art for cabinet. With that dark color you really need something to lighten up the space. And with the dark surroundings, whatever you put in that spot will really pop. Put up something you love! Beautiful, great job. I've done all but the lights in our master bedroom, but I have the hanging ball lights from 1976. The electrical comes from the ceiling. 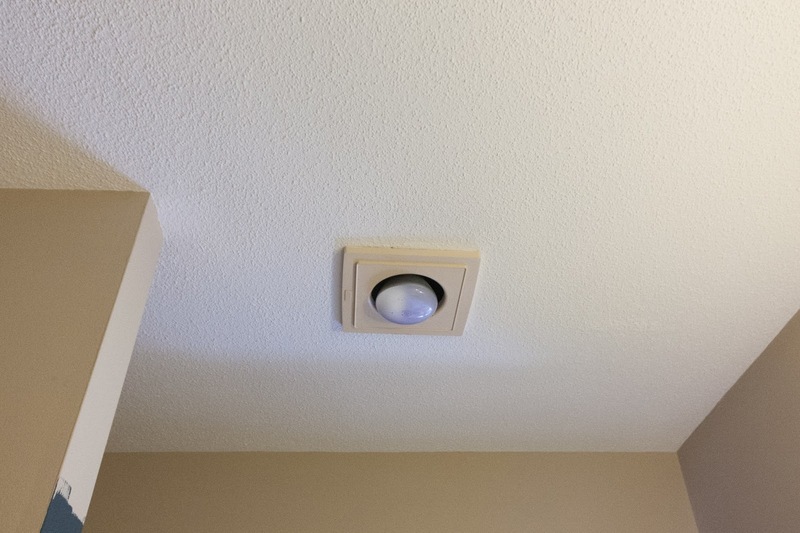 I wish I could find something new to put there, have you ever seen a bathroom light from the ceiling? I like the colour choice! I think this bathroom is really coming along. 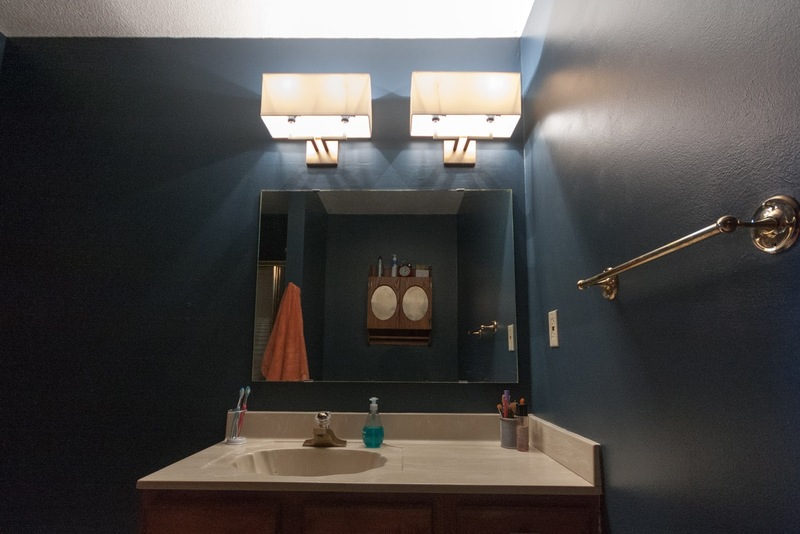 And the light fixtures are A+! Just be careful in the future when you're installing them! Girlfriennnnnd---those lights are everything! They are on the top of my want list now for my master bathroom!!!! It looks great! As to the cabinet, "when in doubt, paint it out". Paint it the same color as the walls and then replace that metal grille with either mirrors, or maybe frosted glass or something like that.